I updated this comparison in 2018 that you can find here. Nevertheless, all the information below explaining how I choose my cheapest online broker remains valid and interesting to know. If you plan to invest your cash into the stock market, you must have faced the question of which broker to choose. A Mustachian wants an online broker with the lowest fees in order to not eat up all of his gains. It starts to get complex when you discover that there exist more than twenty Swiss online brokers with fees going from CHF 100/y up to CHF 2'000/y! There is no simple way to check costs as they depend on your investment strategy. Maybe the moneyland.ch tool can help you but it doesn't take into account worlwide brokers that can be competitive with Swiss ones. As I will start to re-invest my savings after a one-year break, I created a spreadsheet to find out which online broker is the cheapest one. There are several criteria you can use to rank brokers. Some are relevant, and some are futile. Your broker charges you this price to hosts your shares and bonds. It is either a fixed amount or a percentage of your total-portfolio value. Some demand this recurring fees, others don't. Mustachians prefer to not pay it, obviously. Pro tip: when doing your computation, don't forget to add the 8% of Swiss VAT to it. After the custody fees, transaction ones are the second biggest expense of an investor. You pay them each time you buy a security. You want these expentidures to be the lowest possible. Note that each company has its specific rate table for each security type. Your brokers ranking won't be the same if you trade currencies or bonds. We focus on ETFs in this analysis. I remember these 90's movies where traders speculated on their five widescreen monitors. They looked smart and fancy in their Wall Street suit, staring at dashboards full of complex charts, and using stock-picking algorithms to buy and sell shares at the speed of light. Fortunately, you Mustachians don't need any of those tools to make your money work for you. The new "smart and fancy" is an investment strategy which allows you to stay away from the online trading platform as much as possible. Four times a year, you'll spend thirty minutes to buy new ETFs; and once a year, you'll rebalance your portfolio. That's it. You got better to do with your time. And your portfolio will thank you when you don't sell everything because of a panic crisis during a market downturn. Although I love well crafted user interfaces (UI) for services I use frequently, I don't take into account a broker's UI in my assessment of it. The only thing I ask him is to be cheap. And to be functional four times a year. I detailed two Mustachian personas in my spreadsheet. Each has three variants so that it can apply to your situation no matter how much stash you have, nor how much you can invest every month. You surely heard of Swissquote, Strateo, SaxoBank, PostFinance and the many other Swiss brokers out there. I did the math and the result is clear: compared to the Top 3 below, they're not an alternative for us Mustachians; too expensive. If you want to double check my findings by yourself, go to moneyland.ch, choose whatever profile, and once on the list, click on each broker "Info" link to see the details of all their fees, such as the one of CornerTrader. Please note that even though I think my top 3 is the best, you have to check the conditions and fees for your situation. If you stash only a few hundred Swiss Francs every month and if you are afraid to open a brokerage account and if you are too lazy to become a millionaire, then TrueWealth might be for you. It is a decent solution for a portfolio value below CHF 25'000, with its 0.5% of management fees. I tend to recommend it to people who still think that bank savings accounts are great — not to you, wannabee Mustachian. Here is the link to read TrueWealth's information about fees. Prior to this comparison, I invested my savings via Swissquote. If you absolutely want a Swiss broker, I would recommend you CornerTrader nowadays. Two key elements make them more competitive than all other Swiss online brokers: their "No custody fees" policy, and their transaction fees of 0.2% up to CHF 75'000 of stash (minimum of CHF 20/transaction) which decreases to 0.12% when over CHF 75'000 (minimum is then of CHF 18/transaction). Follow this link to read CornerTrader's costs and conditions. I recently stumbled upon praising comments (special thanks to Mr. RIP) and positive reviews like the one from Barron's about this worldwide brokerage firm. Interactive Brokers proposes the ultimate offering for true Mustachians: no custody fees and 0.1% of transaction costs (with a minimum of CHF 10/transaction). I recommend this broker for Mustachians who target early retirement, with way more than 100kCHF invested on the long run. You can check the Interactive Brokers' commission fees as well as their Required Minimums. Like you, I'm a money nerd who trust recommendations like this "Top 3" only if they're based on data. 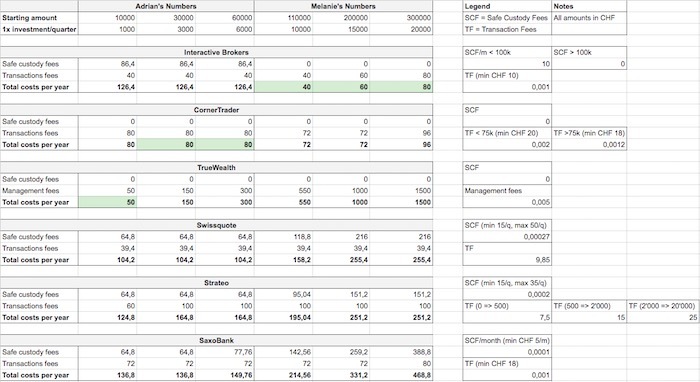 That's why I simulated brokers' fees into the following spreadsheet. Don't hesitate to tell me if you see any inaccuracy. There are two things I'm sure about my online broker choice: I want the cheapest fees on the long run, and I don't want to deal with the hassle of transferring securities from one broker to the other, ever. With this in mind, the decision was easy to take. I will go for Interactive Brokers. We will quickly get over the USD 100'000 mark so their inactivity fees isn't a blocker. I actually see it as an additionnal motivator to reach this amount as quickly as possible. And you, what broker did or will you choose to invest your money into ETFs? Note: if you choose to open an account at Interactive Brokers or CornerTrader via one of my links, you won't notice any difference — but the MP's blog will get a referral commission. I thank you for this. As usual, I only write and review things that I trust and/or use in my personal daily life. In this case, the math made me end up with this Top 3, nothing else.